This is a little quilt I made for my newest grandbaby and I promised a tutorial for all of you. I used a fat eighth pack of 12 different pink fabrics and a piece of pink from my stash. It was enough for the 50 charm squares and the binding. A fat eighth is 9"x22" and you can get four 5" squares and one 2.25" binding strip from each with a 2" - 2.25" strip left over. Match each pink charm square with a white charm square. Draw a diagonal line through the center and sew a quarter inch seam on either side of your drawn line. 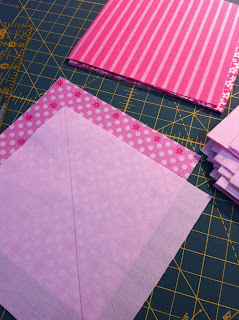 Cut apart on your drawn line and press towards the pink fabric. 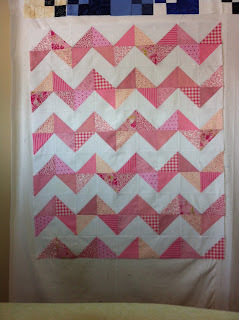 Take all your pink/white squares and lay them out in a chevron pattern. There will be no need to trim to size if you started with all identical squares and piece with a consistent seam allowance. 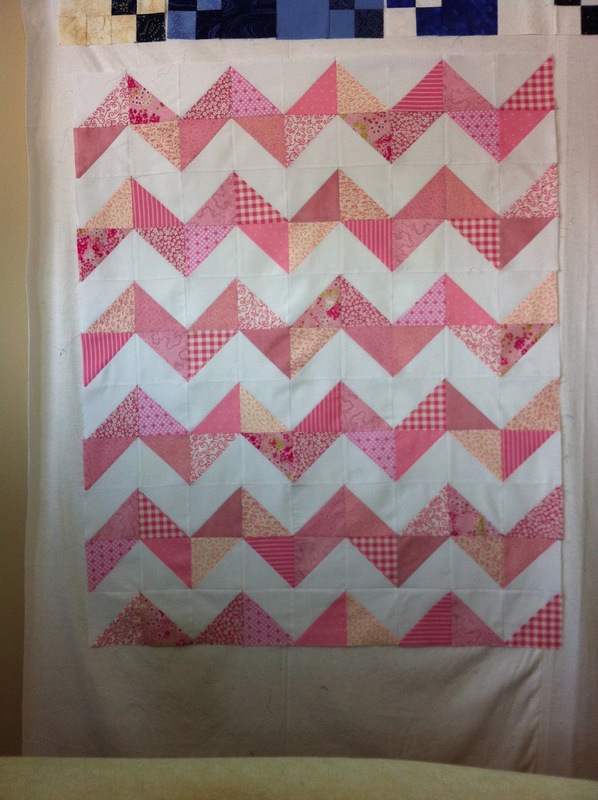 You'll be making a grid of 9 blocks by 11 blocks to make a 36"x44" baby quilt. Sew your squares together to make rows, and then your rows together to finish the top. Almost done! Minkee backing - so soft! I used super soft Minkee fabric for my backing and took special care not to stretch it during the layering and pinning process. And pinned with about twice the pins as I would with a flannel back. And took my time with the quilting to keep the stretch factor down. PS Leave me a comment & a link if you've made something with this little tutorial! I would love to see what you make! Edited 26 Aug 2013 to add: THANK YOU SO MUCH for the awesome response to this tutorial! I am so overwhelmed by the amount of people who have stopped by to take a look and follow along! I didn't make anything but very nice tutorial and quilt! Great tutorial and I love the colors! Soft and pretty! Just found some squares in my stash. Hope to use your tut...it was great. Thanks. Es muy bonito y el tutorial esta muy bien explicado gracias. Beautiful quilt! Excellent tutorial. 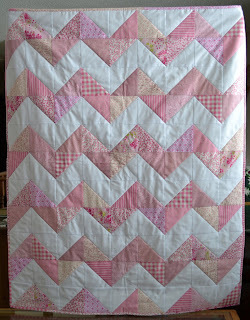 My next project will be to make a chevron rag quilt. Congratulations on being a new grandma! This is a really beautiful quilt! Thank you for sharing! Love the tutorial. Can't wait to try! Really like this little baby quilt. Going to give it a try for my future great grandchildren. thank you. I made this quilt in queen size with 10" blocks in various shades of blue. Still have to bind it though. I will definitely be using this tutorial to make a baby quilt for my soon-to-arrive baby boy! Thanks for an awesome tutorial! Making one right now, but out of charms! I'll give you the URL when I show it on my blog :D Thank you for making this great tutorial! Great tutorial for this beautiful quilt. I think Iam going to have to try to make a quilt now!! Thank you for the info on the chevron quilt! Will be doing one soon for a grandson due in November. My daughter is looking for navy, gold, gray with animal baby prints. Just finished this quilt for my great niece due next month. Turned out awesome. Love the minky back. Great tutorial! Thanks! I used this pattern to make a Giants baseball color them. Orange, black and white. Love it. Used orange minky on the back! Thanks for such a clear and easy to follow tutorial. First Gandchild is in the way, and I'm on my way to the fabric store =) Great tutorial - Chevron it will be!! I LOVE this! Thank you! I just finished my first quilt (a T-Shirt quilt) and needed an easy, inexpensive project for my next endeavor. There are so many possibilities with this-- just wonderful! Those are the BEST! I have adults requesting "those quilts with the bumpy backs" all the time! Great tutorial! 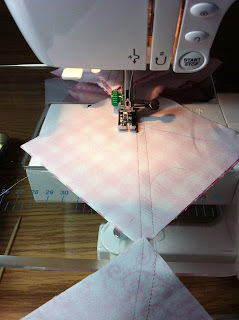 This is so great - I'm in bee at the moment and we are making scrappy chevron stripes using a flying geese ruler. You have made it so easy for me to understand. Will get busy and make my neighbors little girl a quilt. I have a lot of pretty scraps to make this. Just can't wait. Thank you so much for the instructions. I would love to make this quilt, but I need to make it much smaller -- 20" x 27.5" for a preemie blanket. Can you help me with proper measurements? Maybe 5" squares are too big? could I use 2" squares? I'm very new to quilting. Thank you in advance. If you start with 3" squares, the finished squares will be close to 2", which will look good for a quilt that small. I think I might do one this size too, aprox. How many squares will I need? You will need 70 squares main color (pink) and 70 squares background (white). The finished top will be 10 squares by 14 squares and be pretty close to 20"x28". I made this quilt and used borders. Thank you so much for sharing this technique. Triangles haven't always been my friend, but this helped so much. Thanks for sharing. Beautiful! What size did it turn out to be, I'm looking to make a crib size, I've made HST's before, but never have tried a chevron. Can you use of a fat quarter instead of a fat eighth, and how many would I need? Did you use cotton or flannel for the top?